43,8% van de 32 patiënten die op moment van de tussenevaluatie konder worden beoordeeld reageerden goed op dit medicijn, met een klinisch voordeel van 56,3% en een tumorcontrole van 78,1% (stabiele ziekte minimaal). De mediane ziekteprogressievrije overleving was 8,3 maanden. Vaak gemelde bijwerkingen waren neutropenie, haaruitval en perifere neuropathie. Uit de groep van 32 bereikten er drie een CR = complete remissie. Dat is opmerkelijk omdat er zelden uit deze groep van patiënten een complete remissie bereiken met chemo. Hier is dat dus 10 procent. Het volldige studierapport: Phase II trial of eribulin mesylate as a first- or second-line treatment for locally advanced or metastatic breast cancer: a multicenter, single-arm trial met nog veel meer duidelijke grafieken is gratis in te zien. This trial was retrospectively registered at the University Hospital Medical Information Network (UMIN) Clinical Trial Registry (ID number: UMIN000010334). Eribulin may be another option for first-line chemotherapeutic regimens for metastatic breast cancer. 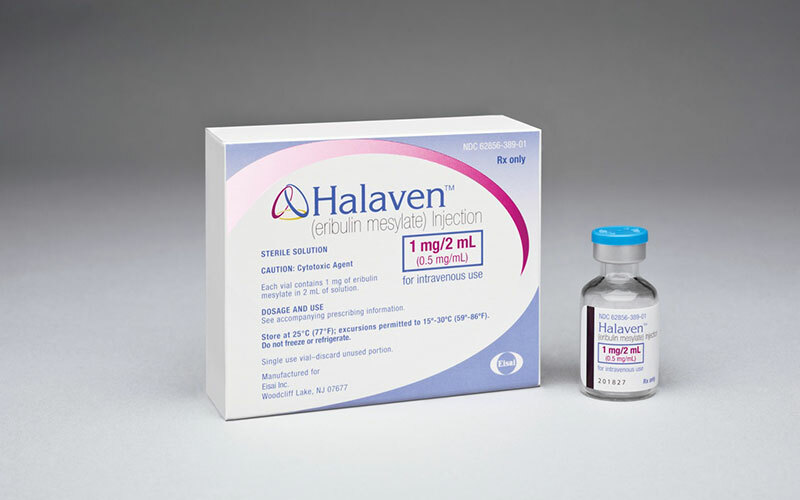 Eribulin mesylate is currently indicated as a sequential monotherapy to be administered after two chemotherapeutic regimens, including anthracycline and taxane treatments, for treatment of metastatic breast cancer. This open-label, multicenter phase II study was designed to evaluate the efficacy and safety of eribulin as a first- or second-line treatment for patients with metastatic breast cancer. The primary objective was to determine the overall response rate. 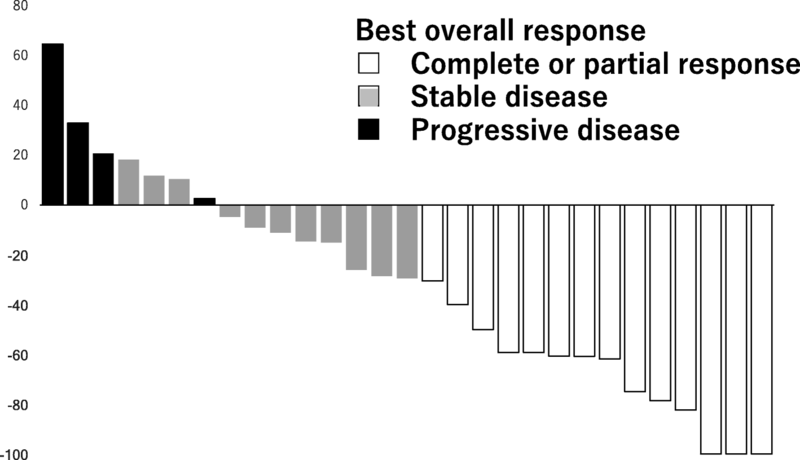 Secondary objectives were to evaluate progression-free survival and the safety profile. Patients were scheduled to receive eribulin mesylate 1.4 mg/m2 intravenously on days 1 and 8 of a 21-day cycle. Patients received the study treatment unless disease progression, unacceptable toxicity, or a request to discontinue from the patient and/or investigator eventuated. Between December 2012 and September 2015, 32 patients with metastatic breast cancer were enrolled at 10 participating clinical institutions in Japan, and toxicity and response rates were evaluated. The overall response rate was 43.8% (95% confidence interval 26.5–61.0). The clinical benefit and tumor control rates were 56.3% (95% CI 39.0–73.5) and 78.1% (95% CI 63.8–92.5), respectively. Median progression-free survival was 8.3 months (95% CI 7.1–9.4). A subgroup analysis did not identify any factors affecting the efficacy of eribulin. The most common adverse events were neutropenia (71.9%), alopecia (68.7%), and peripheral neuropathy (46.9%). As a first- or second-line therapy, eribulin showed sufficient efficacy for metastatic breast cancer compared with taxane and capecitabine treatment in previous clinical trials. The safety profile of eribulin was acceptable. Date of trial registration: April 1st, 2013. Reageer op "Eribuline mesylaat is net zo effectief of beter dan chemo als eerste- of tweedelijnsbehandeling voor lokaal gevorderde of uitgezaaide borstkanker"